Todd Stabelfeldt wants to put paralyzed people to work without threatening their disability benefits. John Vicory. PICTURED: Todd Stabelfeldt runs a successful data management firm that employs mobility-impaired individuals. 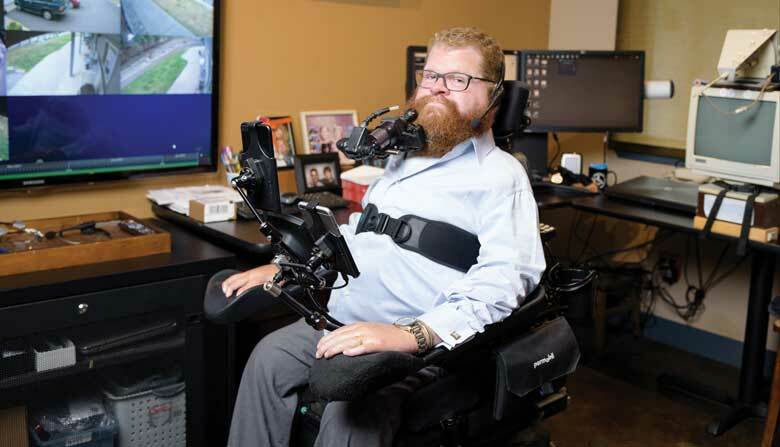 After three decades as a quadriplegic, completely paralyzed below his shoulders, Todd Stabelfeldt knows what independence means to someone with a severe disability. As a successful software developer and owner of C4 Database Management in Port Orchard, he also is keenly aware of the obstacles and opportunities businesses encounter in the quest for true universal design, where buildings, products and environments are accessible to all. Yet it’s a possibility Stabelfeldt wants to explore further. About one in 50 Americans lives with some degree of paralysis caused by stroke, disease or spinal cord injury. For noninstitutionalized, working-age adults, the total rate of disability is 10.7 percent, according to Cornell University researchers. This figure represents a significant customer base for accessible apps as well as a pool of potential employees, such as product testers. But for every Todd Stabelfeldt with his own successful IT firm or Rob Hansen, founder and owner of Tukwila’s Bayview Limousine Service, who became a quadriplegic the same year as Stabelfeldt, there are a dozen others trapped not just by their physical injuries but by financial constraints that prevent them from getting a job. Working for a living, it turns out, is a luxury when you’re a quadriplegic. Stabelfeldt didn’t realize this when he was starting out. He figured getting a job was the key to his independence. The need for significant income can’t be overstated among quadriplegics and paraplegics. The National Spinal Cord Injury Statistical Center estimates the costs associated with a high-level spinal cord injury like Stabelfeldt’s at $185,111 per year, every year. Without a lot of financial assistance, that’s an insurmountable expense. For some, a large legal settlement related to their injury or accident provides the needed cushion. For everyone else, government-funded services are the only way to survive. Stabelfeldt’s latest business idea would provide a staffing service that enables companies to hire disabled workers without the workers risking the loss of the government assistance they rely upon. He knows companies need disabled testers. Companies all want to claim their products are accessible but don’t always have a great way of testing them. Stabelfeldt’s idea is to provide “boots on the ground” disabled testers while also handling the logistics of making sure no one works so many hours that they would lose disability benefits. Then he showed up for an interview with Stephen Steele at Cortex Medical Management Systems, which was situated on Bainbridge Island at the time. Steele asked how much money Stabelfeldt expected. Stabelfeldt told him his school had said he could expect $50,000 a year. Steele offered him half that amount. Stabelfeldt accepted the offer. He commuted from Renton via wheelchair and ferry. His caregiver met him each day at Colman Dock in Seattle. He relied on Supplemental Security Income (SSI) disability benefits for medical expenses and his caregiver, who made more money than he did. It was an awkward arrangement but it worked for about two years. “Then I got that damn letter,” he says. The letter informed him he had been receiving disability payments even though he was employed full time. Payments would stop immediately and his wages would be garnished to pay for $50,000 he had collected since getting a job. As it turns out, his SSI caseworker had retired and it took the government two years to realize Stabelfeldt was working. If it had been caught immediately, that would be the end of the story. But Stabelfeldt now knew what it felt like to work and be independent. More important, Stephen Steele knew what kind of employee Stabelfeldt was. Steele more than doubled Stabelfeldt’s salary, but the raise didn’t change his lifestyle for the better. By 2011, Stabelfeldt was VP of operations at Cortex. He wanted to own his own business, so he quit in 2012. It was a bold move. He had $30,000 in savings. His custodial care cost $12,000 a month. With a subscription-based service, C4 Database Management — named for the level of his spinal cord injury — provides round-the-clock database administration for more than 10 million patient records on 70 servers across the country. It’s the closest he figures he’ll get to an old dream he had of becoming a psychiatrist or a Navy SEAL. Stabelfeldt’s work gives him purpose, something he says he and his peers desperately need. By Stabelfeldt’s reckoning, businesses producing new products need quadriplegics and other disabled workers as well. More than a million adults in Washington live with some form of disability, according to the Centers for Disease Control (CDC). Of those, 188,000 report that they are not able to dress or bathe without assistance, according to the CDC. And it’s a population that’s growing, not shrinking. After searching for a home that could meet his needs and the needs of his database management company, Todd Stabelfeldt, who calls himself “The Quadfather,” and his wife realized they would have to build it. He didn’t want to settle for the basic no-stairs version of accessibility; he wanted a home where he could feel truly in control, not dependent upon his wife or a caregiver. Todd Stabelfeldt uses Apple’s Switch Control, an accessibility feature that lets him employ his iPhone and other devices to control electrical systems in his home. Essentially, he wanted a home automation system, but he couldn’t find anyone willing to help him design it. That was three years ago. George says he didn’t make any money on the Quadthedral project, but he acquired a lot of knowledge that he uses in installing high-end automation systems in other homes. It took hours of programming and effort. Today, systems like Apple HomeKit and Google Home can replicate many of the features George installed in the Quadthedral. Stabelfeldt is such a fan of Apple products that he accepted an invitation to speak at Apple’s Worldwide Developer Conference earlier this year. Stabelfeldt also “stars” in an Apple-produced video titled The Quadfather, which demonstrates how he uses Apple technology in his home. — C.R.-S.